Fitness Pollenator: Can You Bench Press Every Day? Conventional wisdom says you can’t bench press every day. Your shoulders and elbows just can’t take it. You can squat every day. You can eat an apple every day. But you can’t bench press every day. They lacked balance between their pushing and pulling strength. They didn’t have a plan, or at least not a good one. Because my one-rep max pull-up is actually 25 pounds heaver than my best bench press — and I had what I thought was a flawless plan — I was confident I could bench every day for a month. After that, I’d rest for a few days, then PR my bench by 10-20 pounds. In order to avoid overloading my joints, I would train five days per week (Monday–Friday) and use a different variation of bench each day. I’d focus on undulating the loading parameters and rep ranges and using varied tempos and bar setups to overload different phases of the lift. I would auto-regulate depending on how I felt that day. Summoning my inner Goldilocks, some days would be heavy, some would be light, and some would be juuuuuust right. My menu of barbell presses included close-grip bench, bottoms-up bench from pins, overcoming isometric bench, eccentric bench, banded bench, paused-rep bench, 1.5-rep bench, squeeze press, and guillotine press. My plan also included supplementing pushing with lots of pulling. Each day, after benching, I intended to perform some sort of row, pull-up, or face pull. On top of that, between sets of bench press, I would focus on a low-level rotator cuff or "shoulder care" exercise like band pull-parts, scapular slides, external rotation, or lower trap raises. Things were going great for the first 2.5 weeks. I even e-mailed the editor of an online fitness publication to pitch my idea for an article about my experiment. Then, one morning, I woke up with a cranky shoulder. All morning I fretted over whether to take a day off from benching or try to push through the discomfort. If I skipped benching for a day, would it completely invalidate my theory? Or, on the contrary, would it just add the wrinkle that you have to be smart about it? If you’re not feeling it one day, then skip it, rest up, and return the next day. When the time came for my afternoon workout, I decided the latter was the smarter move. And, to my good fortune, as the day continued the shoulder pain subsided. Then — like an idiot — at the end of the day I decided to keep my streak alive and do a few quick sets of bench before heading home. Now, thanks to lingering shoulder, upper trap, and neck pain, I haven’t benched since. Was there a hole in my plan — or in its execution? 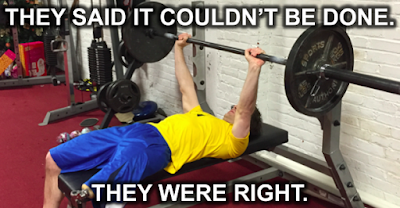 Or can you really just not bench press every day, no matter who you are and how good your plan? Looking back, I realize I didn’t do all that great a job of balancing the pushing with an equal amount of pulling. (I estimate I was performing about six sets of bench press to every three sets of pulling exercises.) I also didn't listen to my body and take a break at the first sign of discomfort. In addition, my experiment coincided with the CrossFit Open, which had me performing weekly high-rep workouts that included shoulder-intensive exercise like snatches and (kipping!) pull-ups. Finally, I’d already been having neck issues for a few months, likely stemming from the fact that I’m in dire need of a new pillow. Prior to this whole ordeal, I was well-nigh convinced that the people who said you can’t bench every day were simply doing it wrong. Now I’m not so sure. Maybe you can bench every day for two weeks but no more. Maybe benching, which requires the shoulder blades to stay pinned to the bench, needs to be balanced with a healthy diet of pushing exercises that allow freedom of movement of the shoulder blades (e.g. push-ups, overhead press, dips). Or maybe there's something else that I'm still missing. In the future, I plan to run this experiment again, only with more pulling (and/or fewer sets of bench daily) and better control of confounding variables. It’s definitely important to challenge one’s biases, but for now I’ll have to side with conventional wisdom: you can’t bench press every day.